Cribbing from Sheldon, I've devised a spiel on the virtues of UJBs and I've sold quite a few of the bikes to happy customers. My spiel is pretty convincing, but some times the bikes have seen a lot of use over the decades and the frames are looking pretty rugged. We tend to sell those rougher looking frames at bargain prices to folks on low budgets. I'm a guy on a low budget and it's a darn convincing spiel. I also tend to say, "yeah, it looks rough now, but a bit of work with some emery paper and Rustoleum and it'll clean right up." Sometimes you get convinced by your own sales pitch and then you have to see if you really know what you're talking about. So I bought this Shogun (time will tell if I keep this bike or if it's just another in my ongoing bicycle catch-and-release program). I'd been looking for something to try out the Origin-8 bars on and the Shogun seemed like a good candidate. Version one of the build was wildly ugly with orange grips and a saddle with yellow highlights. 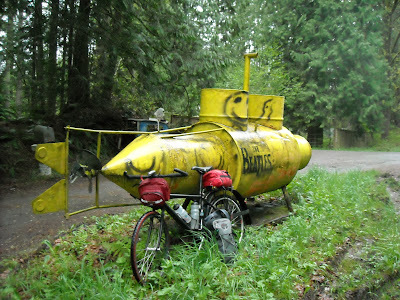 But the bike rode great, so this weekend I made a quick run to the hardware store for some paint and masking tape. The slide show tells the story. With the now classy-looking frame, I decided to go with a more sedate saddle and a basic black tape for the grips. It's the nicest looking bike I've had in quite some time. Raymond Bridge's book, Bike Touring: The Sierra Club Guide to Travel on Two Wheels , is the second, completely revised edition of a book Mr. Bridge originally wrote 30 years ago. In the thirty years since the first edition, some things have changed. We now have Internet forums to discuss our tours, we can track our routes using GPS and the Adventure Cycling Association has mapped out thousands of more miles of routes, but the lure of the open road is still the same. In this age of Internet wonder, Raymond Bridge has created a book that does the thing that books still do best: he's created a compact, clear guide that condenses a wealth of practical how-to information into a portable, organized form. He explains the various types of bike touring a person might do from commercial tours to roof-to-roof and independent bike camping trips. 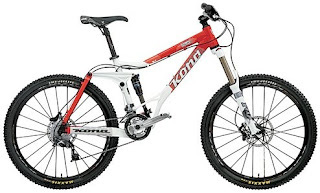 He discusses a variety of bikes, explaining both fit and function, telling not just what options exist, but why a person might choose one bike or component over another. He explains basic roadside repairs, camping skills and things like the logistics of transporting your bike before and after your tour. I'm really not the intended audience for a book like this, as I've been traveling by bicycle since before the first edition of this book was new, and yet I still found this book to be wonderfully organized and complete. With a critical eye, I'd find myself asking "yeah, but does he mention alcohol stoves?" Yep, he does, not only mentioning commercial stoves, but pointing his readers to a couple of instruction pages on the Internet for those who like to make their own stuff. This is typical of the book, it is marvelously complete in itself, but it also sends you off on your own journey. In Bike Touring: The Sierra Club Guide to Travel on Two Wheels , Raymond Bridge has written a marvelous starting point for anyone interested in travel by bicycle. John Lencicki's wonderful drawings are sprinkled throughout the text, adding both clarity and charm to this book. My only complaint with this volume is the cover. 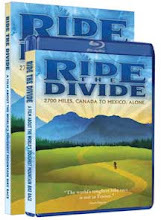 This is a book that inspires and enables folks to get out on the road and experience the freedom of two wheels. The text and drawings inside the book capture that far better than the dull photograph of a pannier, water bottle, helmet, map and glove which the Sierra Club chooses for the cover of this book. In this case, don't judge a book by its cover. This one is better. I now have a guide to hand to anyone looking to get out and see the world from the seat of a bicycle. Gabriel is one of the Bike Works Earn-a-Bike kids and he's worked very hard refurbishing bikes for other kids. Now, he's working on a super cool bike of his own, but he's run into a problem and we don't have the needed bit here at Bike Works. I'm turning over my blog to him for a bit so he can explain the problem. Maybe one of you kind folks out in cyberspace have just the bit Gabriel is looking for. Take it away Gabriel! Hello “Kent's Bike Blog” Readers! My name is Gabriel and I go to Bike Works for the youth programs. I am nine years old. I love bikes a lot. My favorite thing is the feeling when you finish building a bike and take it out on the road for the first time. I am working on a smaller than usual road bike, an Italian Eurospecial for myself to ride. I have been wanting a road bike for my entire life as a cyclist. This bike is awesome because it is vintage and has a whole bunch of really cool bike parts on it. The bike comes from far away, it is Italian! Unfortunately, it has a bent fork and I am wondering if you can help me find a replacement fork that isn't broken. It has to be compatible with a 24” road wheel. I am building this bike out of parts that have been donated to Bike Works, if you have a fork you could donate to my special project, please email Kent ( kentsbike (at) gmail.com). Here's a bit more info about what's needed. The fork should have a 1inch steerer tube six at least 6 inches long (we can cut it down if needed). Threaded is best but we could make a threadless fork work by going to a different headset. A fork out of a Terry bicycle or one of the old time trial bikes with the 24" front wheel would be perfect. It's a long shot, but does anybody out there have such a thing kicking around? Gabriel has a budget of about zero dollars for this and Bike Works runs on shoestrings we make out of bits of other shoestrings, so I'm happy to put my blog to work on this quest. If you've got a fork that will help Gabriel out, please let me know. 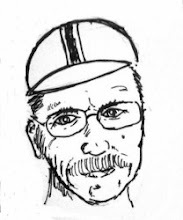 My pal (and I know he's my pal because he's mocked me on his blog) Elden "the Fat Cyclist" Nelson is continuing in his quest to raise something like fifty-seven trillion dollars to fight cancer. Maybe it's not quite fifty-seven trillion, but it's a lot and Elden is good at coming up with fund raising schemes that are actually quite fun. He talked me into doing the Seattle Livestrong Ride next month as part of Team Fatty and thanks to the generosity of a bunch of you, I've raised over 500 bucks for this good cause. Fatty's latest plan not only will raise a lot of money, anybody who pledges will be entered into a contest to win the bike you see at the top of this blog post. Cool, eh? You can read all about it on Fatty's site. Now while you can read about the contest on Fatty's site, I'm going to ask that instead of pledging some bucks there, you go here instead. That's my Livestrong Page. Same cause, same deal. Same odds of you winning. OK, according to the way Fatty has set it up, every time somebody pledges through my Livestrong Page between now and midnight MDT May 25th, I actually get a chance of winning the bike. Me, as in not you. But here's the deal. Look at that bike. It's light. It's got gears. It's got shocks. It's just so not my kind of thing. So if I win the bike, I'll draw from the list of folks who pledged through my Livestrong Page this week and one of those lucky people will get the bike. But wait, there's more. OK, not a lot more. I don't have a lot of those big, famous blogger connections like Fatty does but anyone who pledges through my Livestrong Page between now and midnight MDT May 25th and emails me at kentsbike(at)gmail.com will get a Livestrong wristband. And if one of you great pledgers wins the bike, I'll shave my head the day before the Livestrong ride. But finally, there is one more reason to pledge through my Livestrong Page. It will send a signal to Fatty, a loud, clear signal, that we are fighting against cancer and that helmet mirrors are cool. C'mon, you know they are. And recumbents are pretty cool too. So dig deep and pledge what you can. Thanks and keep 'em rolling. Douglas Coulter, the mad troubadour of the touring list, whose madness is one of the saner responses I've seen to these mad times, once wrote that all his tours are failures. If my goal is ultimate simplicity, I similarly fail on each journey, for my monkey mind gathers far too many shiny things and carries these burdens too far for too long. But, perhaps, a goal is only that which gets me rolling down the road, where my burdens resolve either into the strength needed to carry them further or the certainty needed to leave them behind. With thoughts such as these for companions, I pedal southward, into the wind. My gear today is too much, something I'll know for certain when I return home with unworn t-shirts and a laptop that I've lugged for miles and never used but in the words of the Indigo Girls , my kit is getting "closer to fine." My gear today is minimal but more than sufficient. Using Colin Fletcher's metaphor of a house, my baggage consists of three main rooms. The bedroom sits on the bike's rear rack. A single waterproof compression stuff-sack contains my sleeping bag , bivy sack, Therm-a-Rest pad, tarp-poncho, ground-cloth, 4 tent stakes and my cozy camp jacket/vest. The jacket/vest, which is too warm to wear while riding, extends the comfort range of my 18 ounce sleeping bag down to the freezing point. The total weight of the bedroom is under 5 lbs. Up front, a small handlebar bag contains the pantry and workshop. The main compartment holds whatever I feel like snacking on at the moment, today it contains Payday and Clif bars , while the smaller compartment contains a spare tube, patch kit, tire levers and chain lube. I have two water bottles in the main triangle of the bike and a Topeak Morph pump strapped behind the seat tube. Battery powered Planet Bike head and tail lights are sufficient to get me through the longest, darkest nights. For security, I carry an OnGuard Mini U-Lock on my rear rack. A bungie cargo net secures the load to the rear rack. My closet is an Osprey Daylite backpack holding not only my spare clothes (a couple of t-shirts, a long sleeve wool t-shirt, a pair of wool socks and a second pair of shorts) but also way more technology than what any wanderer actually needs. In addition to my camera and cell phone, I'm packing my Eee PC in case I'm overcome with overwhelming web-withdrawal and my Peek Pronto connects me to all the email obligations I carry with me. There's a school of thought that says I should be letting the bike carry all the weight and not use a backpack, but packs have proven to be handy to me over the years. The valuable bits stay with me when I lock up the bike and go into a coffee shop or wander around and keeping some weight on my back keeps me honest. The pack weight gets questioned every trip. In addition to the above mentioned items, the pack holds my toothbrush and razor, whatever book I'm reading, chargers for the gadgets, local maps and other bits that build up until I say "enough" and pare things down again. It's always a learning process. The backpack expands and contracts as I layer clothes on and off depending on conditions. I wear a cotton cycling cap under my helmet and in cold conditions I wear a warm cap over the cotton one to cover my ears. Both my outer jacket and pants are convertible, with parts that zip off and dry quickly. It took me years to figure out that the key to wet weather comfort was not to battle to stay totally dry, but to have clothes that are comfortable when damp and dry quickly. My Marmot DriClime Windshirt is the best single garment I own and it is pretty much always on my person or in my pack. I carry the gets-damp-but-dries-quick theme down to my feet and found that the looks-dorky-but-really-works Pacific Northwest fashion of wool socks plus sandals. On each trip I learn something. I've learned that by traveling light, I can travel far. With minimal gear, I need a minimum of gears, and touring on a fixed gear or single speed bicycle is not only possible, it's fun and instructive. In wind, rain, sun or whatever I can roll and think and learn something from every day, night, road and trail I roll down. The distance I have to cover is not far and I have sufficient time to hasten slowly. One of the wisest things I've ever read was written by the great sage Sheldon who asked "If you are in a hurry, why are you on a bicycle?" Since I am traveling at least as much to travel as to arrive, I have time to think and pause and photograph that which is odd or common or interesting. Each tour is not a failure, each trip gets me closer to fine. One of my entanglements with the world involves monitoring the info@bikeworks.org email and routing queries appropriately. While in theory I could rely on Wifi connections with my Eee PC or Nokia N800 to deal with this task or spring some extra bucks up front and every month till the end of time for a smarter cell phone, the Peekonomics 101 video combined with my "ooh-nifty" response and an excess of Amazon credit made me press that buy-now button that promises every good consumer that we can spend our way to frugality. I now am the happy owner of a Peek Pronto . I recently took the Peek with me on my cycling trip from Issaquah to Olympia and back and the little 109 gram gadget proved itself to be an extremely handy companion. So even though this is a cycling blog, it's going to turn into a gadget blog for at least the duration of this post and if such things bore you, feel free to surf away. The most important thing to understand about the Peek is that it is JUST AN EMAIL DEVICE. It does not make phone calls. It does not surf the web. It does not take pictures. It does not play music. It is JUST AN EMAIL DEVICE. Actually, the Peek will also do text messages and if you're into that Twitter thing it'll do that as well, but basically the Peek is JUST AN EMAIL DEVICE. It's the simplicity that got me. The same impulse that makes me think things like "hey, I bet I could tour on a fixed gear bicycle!" makes me think "hey, I bet I could do a lot just with email!" And while that turns out to be true, as the Peek folks themselves admit "making it simple can be...complicated." But just as pushing against the limits of a single gear makes me stronger while questioning every gram of my touring kit, the Peek's limits made its designers and users come up with some interesting solutions. The Peek makes sense for me because I've never been much of a phone person. My cell phone is a minimal, pay-as-you go device and I tend to spend less than $5 per month on it. Add on the $20 per month to feed email into the Peek and I'm still paying much less than I would for an iPhone. And I get a decent keyboard out of the deal. Yeah, the Peek has a surprisingly good little keyboard. And the connectivity is darn simple. Tell it your email and password, pay for a month of access and you're good to go. I hooked it to my gmail account which was already hooked to my work email accounts, but the Peek will handle up to five different email addresses. I think the Peek connects to the big cloud in the sky via T-mobile but I'm not sure about that and I don't need to know. All I know is the thing hooks up and grabs my email. Throughout my trip and the couple of weeks I've had the Peek, it does what it's supposed to do, it lets me send and receive email from anywhere. The Peek saves time by just grabbing the first 4K of a message and for a lot of email's that first 4K is plenty, I read enough to know where to route the mail and send it off. In other cases, I read more. Once I get to the end of the 4K, the Peek says [Retrieving more] and gets the next chunk. This can continue for a while and on huge emails the Peek will hit a point where it says [Wow! This file is too long for your Peek. View the rest on your computer.] In my world, I don't hit this limit too often and when I do, it's just about at the point where I'm figuring I shouldn't be doing this much work out of my pocket. But if this limit bugs you, the Peek isn't your kind of thing. Sending a zip-code or a city-state pair to weather@askpeek.com will return a weather forecast for that area including some weather maps as attached jpeg files. Sending an address to maps@askpeek.com will return a zoomed Google map and an area overview map as jpegs. News@askpeek.com will give you news headlines from NPR, the BBC or the New York Times. You specify your prefered news source in the subject line of the email. Other email services from Peek include local traffic reports and Google local search results. Sending the Subject "help" to ent@retroforth.org returns a list of various useful things like text versions of world wide web sites and local movie times available from Ent. I used the Peek multiple times each day of my trip. I kept my wife up to date on where I was camping and used the map feature to find the house I stayed at in Olympia. I kept on top of my work email so I didn't have a big pile of it waiting back at Bike Works when I returned. And even though I've said over and over that the Peek is JUST AN EMAIL DEVICE, it also works fine as a clock and a flashlight for finding your way around a dark campsite. And I've been using the draft function of the email editor as a notepad. And you'll be happy to know that most of my notes are for a whole series of bike repair blog posts. Thanks for your indulgence in this gadget geek-fest. We now return you to your bike blog, already in progress. 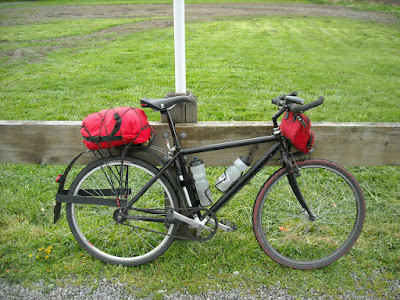 I had a nice trip down to Olympia, despite headwinds and intermittent rain. I still travel with too much stuff but the kit is getting more compact. I'd started a longer blog post, which I've just nuked in favor of a series of shorter thoughts that should be filling this space over the next while. For now, enjoy some pictures from the road to Evergreen and back again.